Data Epistemologies: Surveillance and Uncertainty, my dissertation at the University of Pennsylvania, is now online for public access here. It is, in many ways, a working draft for my current book project. Data Epistemologies studies the changing ways in which ‘knowledge’ is defined, promised, problematised, legitimated vis-á-vis the advent of digital, ‘big’ data surveillance technologies in early twenty-first century America. As part of the period’s fascination with ‘new’ media and ‘big’ data, such technologies intersect ambitious claims to better knowledge with a problematisation of uncertainty. This entanglement, I argue, results in contextual reconfigurations of what ‘counts’ as knowledge and who (or what) is granted authority to produce it – whether it involves proving that indiscriminate domestic surveillance prevents terrorist attacks, to arguing that machinic sensors can know us better than we can ever know ourselves. The present work focuses on two empirical cases. The first is the ‘Snowden Affair’ (2013-Present): the public controversy unleashed through the leakage of vast quantities of secret material on the electronic surveillance practices of the U.S. government. The second is the ‘Quantified Self’ (2007-Present), a name which describes both an international community of experimenters and the wider industry built up around the use of data-driven surveillance technology for self-tracking every possible aspect of the individual ‘self’. By triangulating media coverage, connoisseur communities, advertising discourse and leaked material, I examine how surveillance technologies were presented for public debate and speculation. This dissertation is thus a critical diagnosis of the contemporary faith in ‘raw’ data, sensing machines and algorithmic decision-making, and of their public promotion as the next great leap towards objective knowledge. Surveillance is not only a means of totalitarian control or a technology for objective knowledge, but a collective fantasy that seeks to mobilise public support for new epistemic systems. Surveillance, as part of a broader enthusiasm for ‘data-driven’ societies, extends the old modern project whereby the human subject – its habits, its affects, its actions – become the ingredient, the raw material, the object, the target, for the production of truths and judgments about them by things other than themselves. The podcast recording of my talk at MIT is now available here, or just click play below. New piece at the open source Communication+1, titled ‘Data’s Intimacy: Machinic Sensibility and the Quantified Self’. This is the first of, I think, two or three pieces on self-tracking that will be rolling out over the next couple of years. Today, machines observe, record, sense the world – not just for us, but sometimes instead of us (in our stead), and even indifferently to us humans. And yet, we remain human. Correlationism may not be up to a comprehensive ontology, but the ways in which we encounter, and struggle to make some kind of sense of, machinic sensibility matters. The nature of that encounter is not instrumentality, or even McLuhanian extension, but a full-blown ‘relationship’ where the terms by which machines ‘experience’ the world, and communicate with each other, parametrises the conditions for our own experience. This essay will play out one such relationship currently in the making: the boom in self-tracking technologies, and the attendant promise of data’s intimacy. This essay proceeds in three sections, all of which draw on a larger research project into self-tracking and contemporary data epistemologies. It thus leverages observations from close reading of self-tracking’s publicisation in the mass media between 2007 and 2016; analysis of over fifty self-tracking products, some of it through self-experimentation; and interviews and ethnographic observation, primarily of the ‘Quantified Self’ connoisseur community. The first section examines the dominant public presentations of self-tracking in early twenty-first century discourse. This discourse embraces a vision of automated and intimate self-surveillance, which is then promised to deliver superior control and objective knowledge over the self. Next, I link these promises to the recent theoretical turns towards the agency of objects and the autonomous sensory capacities of new media to consider the implications of such theories – and the technological shifts they address – for the phenomenology of the new media subject. Finally, I return to self-tracking discourse to consider its own idealisation of such a subject – what I call ‘data-sense’. I conclude by calling for a more explicit public and intellectual debate around the relationships we forge with new technologies, and the consequences they have for who – and what – is given which kinds of authority to speak the truth of the ‘self’. On September 15, I will be giving a talk at MIT’s CMS/W department, titled ‘Knowledge’s Allure: Surveillance and Uncertainty’. I will be covering some of the material I am remoulding from dissertation to book. I think a podcast version will be uploaded online some time afterwards. For the physical event, it’s 5pm, location 3-133. More info here. What happens when the ‘what if’ functions as the key operator for the Reason of counter-terrorism, criminal justice and national security? 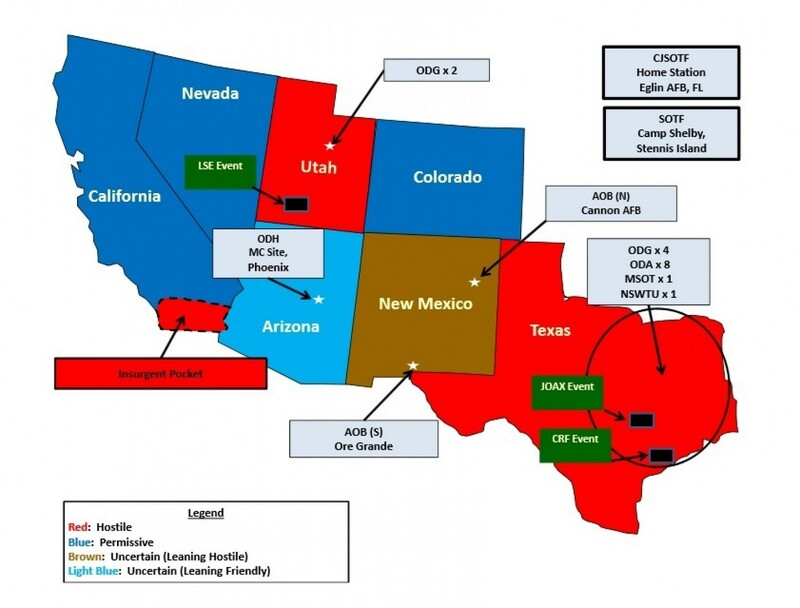 In 2015, a map used in the US military’s ‘Jade Helm’ training exercises was leaked to the public, provoking commentary, speculation and conspiratorial interpretation. The map, detailing one of Jade Helm’s mock scenarios, showed Texas and Utah as ‘hostile states’, which friendly (‘permissive’) states like California and Colorado might help subdue. At the same time, a different rumour made the rounds. Whispers in the air: concrete ISIS terrorist bases had been discovered in Texas. Senator Ted Cruz, “fresh from his Jade Helm inquiry” (New Yorker), accused the incumbent government of failing to connect the dots. (As we all know, he would show up in presidential debates a few months later, sweating and spitting with promises of being tough on Islamic terrorists.) A mock military scenario and an unconfirmed rumour had mutually reinforced each other’s status as half-truth, or rather, operationalisable fiction. One poll of registered Republican voters immediately following the leaks pegged 32% as “think[ing] that the Government is trying to take over Texas” (Public Policy Polling). Since then, Donald Trump as the season’s flavour has everyone wondering: where have all the facts gone, or rather, why do they seemingly have no value anymore? How to run the marketplace of ideas without them? But it’s not a binary switch, just different rules of the game. Since 2001, America’s discourse on terrorism – both inside and outside the relevant agencies – narrated the threat as becoming radically unpredictable and radically distributed, producing a situation where traditional prudence in acquiring ‘certain evidence’ became unrealistic. A double-bind: on one hand, you admit that you can ‘never be sure’ if the kid you arrested would really have killed dozens, or where the ‘next attack’ will strike. You can’t wait for certainty. On the other hand, the political and moral pressure to predict and prevent becomes overwhelming. Hence, long before Donald Trump, traditionally ‘respectable’ politicians like Tony Blair, confronted with the Chilcot Report, argues that ‘doing something was better than doing nothing’. Beneath the political limelight, security and counter-terrorist practices in FBI sting operations to biometric surveillance at airports have embraced the use of scenarios, simulations, and ‘what if’ logics to try and plug the gap between knowledge and danger (e.g. the work of Peter Adey, Claudia Aradau, Rens van Munster). Let’s look more closely at one such practice which combines the fear of uncertainty with the fantasy of prediction – one where the mad beast is incited and produced, precisely so that it can be felled in public and a sense of security restored. 1. In 2011, an FBI sting operation began to form around Sami Osmakac. A Kosovo-born American and Muslim, his trusted Muslim friend had introduced him to a man named Dabus, an FBI informant who in turn connected Osmakac to an undercover agent named ‘Amir Jones’. To that point, Osmakac’s record of suspicious activity included a tendency to verbally criticise democracy, argue for his religion in combative and fundamentalist terms – and one streetside fisticuffs with a Christian street preacher that had recently gotten him arrested. In other words, little in the way of convictable behaviour. After meeting Dabus and Jones, however, Osmakac was supplied with money, with which he could purchase (fake, prepared) weapons and explosives; he was trained in their use; and he was even given money for a taxi so he could show up to his own attack spot, where he was finally arrested by the FBI. During the process, the FBI agents spoke of Osmakac as a ‘retarded fool’ who needed the FBI’s support to turn his ‘pipe-dream scenario’ into any semblance of a real threat – a result which they referred to as a ‘Hollywood ending’ (The Intercept). The FBI provided material and psychological encouragement that allowed Osmakac to become ‘dangerous enough’ to be legally and operationally eligible for arrest. Of course, this also means that it becomes impossible to ever confirm whether Osmakac would have acted without such encouragement; the price of a pre-emptive certainty is the absolute unconfirmability of justice. 2. Basaaly Saeed Moalin, a Somali-American, was arrested in 2013. Subsequently, as the Snowden leaks swept the nation, advocates of US government surveillance referred to Moalin as the one case that could be publicly cited as evidence that surveillance worked. In other words, Moalin was supposed to be the proof that pervasive domestic dragnets aren’t just stabs in the dark, but reasonable procedures at reducing uncertainty. The problem is that Moalin too was coaxed and aided towards this status. Arrested on charges of conspiracy and material support for terrorism – specifically, posting $8,500 to a Somali contact associated with the jihadist group al-Shabaab – the prosecution argued that Moalin’s frequent phone calls and money transfers supported terrorism. In court, the defence directly contested this interpretation of available evidence – and in doing so, publicy exposed the fabrications as a set of uncertain and primordial indices oriented towards certainty. Picking apart Moalin’s phone calls collected by telecommunications surveillance, the defence argued that his comments about ‘jihad’ referred to a local jihad in his native Somalia against the Ethiopians; that his money transfers to his homeland had gone to projects for schools and orphanages; and, indeed, that no record showed any definitive statement in support of terrorist attack (Washington Post). BASAALY [Moalin]: We are not less worthy than the guys fighting. ISSA: Yes, that’s it. It’s said that it takes an equal effort to make a knife; whether one makes the handle part, hammers the iron, or bakes it in the fire (New Yorker). These practices go beyond traditional sting operations, bordering close to that toxic word ‘entrapment’. We might call them fabrications: the deliberate, planned, and increasingly systematic practice of producing what sufficiently ‘counts’ as evidence in counter-terrorism operations. Osmakac is joined by an increasingly sizable contingent – mostly young, Muslim, with a history of mental struggles, and typically with few or no convicted/convictable offences prior to their snaring. One report puts their number at around 30% of counter-terrorism convictions between 2002 and 2011 (Human Rights Watch). Fabrication is the practical expression of the ‘what if’ as the operator of counter-terrorist rationality. While some degree of fabrication is by definition a necessary part of any preemptive measure, we are seeing a visible embrace of more speculative forms of knowledge that could license more actively interventionist efforts – largely because it is thought that the threats of post-9/11 terrorism does not permit the luxury of greater proof and certainty. If these suspects were being directed and shaped on the basis of potential rather than actual danger, operatives and politicians argued, so be it: such pre-emption is the only way to ever ‘know enough’ in time to stop the next attack. We get a direct glimpse of this in the recent documentary Homegrown (HBO, Greg Barker). People like me are in a difficult position. We cannot afford to let dozens of innocent people die because a youth makes a mistake […] If we switched roles, what would you do? What would you do? Would you let him go? The ‘zero-tolerance’ policy renders uncertainty intolerable. It is far less acceptable to respect the rights of suspects, because one cannot write off any attack as an ‘acceptable’ or unavoidable loss. And yet, in so many cases, especially that of lone wolves and ‘home-grown’ terrorists, the possibility of crime remains uncertain until it is too late to intervene. Fabrication fills this gap, ensuring that uncertainties are coaxed into the realm of sufficiently known. Thus zero risk, worst case scenario, and the changing status and nature of ‘proof’ are all arranged to follow rationally from each other. Data Epistemologies studies the changing ways in which ‘knowledge’ is defined, promised, problematised, legitimated vis-à-vis the advent of digital, ‘big’ data surveillance technologies in early twenty-first century America. As part of the period’s fascination with ‘new’ media and ‘big’ data, such technologies intersect ambitious claims to better knowledge with a problematisation of uncertainty. This entanglement, I argue, results in contextual reconfigurations of what ‘counts’ as knowledge and who (or what) is granted authority to produce it – whether it involves proving that indiscriminate domestic surveillance prevents terrorist attacks, to arguing that machinic sensors can know us better than we can ever know ourselves. Having concluded my dissertation at Penn, I will, from July 2016, be located at MIT as a Mellon Postdoctoral Fellow (see here, though I am listed yet). I will be affiliated with the Comparative Media Studies / Writing department as I continue to write about data, technology, new media, surveillance, objectivity, and our twisted desires and fantasies coiled round those ideals. I will presently be floating the dissertation title and abstract. This June, I will be at ICA 2016, Fukuoka, Japan; I expect that I will be running into many familiar faces! I will be presenting two pieces of work. First, I’ve organised a panel called The Quantified / Qualified Self; Alison Hearn, Lee Humphreys, Jessa Lingel and I will be talking about the various ways in which new media’s quantification of the human also entails qualitative shifts in our narratives, habits, perceptions of the ‘self’. I will also be at the preconference ‘Algorithms, Automation and Politics’, organised by the folks at Political Bots. While political communication and IR scholars are not my usual interlocutors, that’s exactly why this should be interesting (and, in fact, I have no idea what the disciplinary demographic will be like). I’ve put up a version of my abstract over at untimely.co., titled The Metapolitics of Algorithmic Politics. Last October, I was at Digital Existence: Memory, Meaning, Vulnerability, a conference organised by the group Existential Terrains. This talk indexes some of the themes that I am currently working through in the dissertation project: what counts as ‘knowing’ about surveillance if I am told so much about it, but can almost never experience it, handle it, grasp it? What does it mean for the state to insist that indiscriminate data collection is necessary to know a terrorist threat that it defines fundamentally unknowable? And what about self-tracking devices, which promise a more intimate kind of self-knowledge precisely by having machines pre-empt our own intuitive access to ourselves? The full talk and slides are available over at untimely.co.